I recently finished reading The Stop: How the Fight for Good Food Transformed a Community and Inspired a Movement by Nick Saul and Andrea Curtis. It’s the story of The Stop, which started out as a food bank over 30 years ago and grew into a community food centre, a place where people come together to grow and cook food, learn food skills, build community, and become empowered to advocate for changes that will ultimately put an end to poverty and hunger (check out this video about The Stop). After 14 years at The Stop, Nick Saul is taking the concept national through Community Food Centres Canada, which will raise funds and work to create more community food centres in low income communities across the country. Food insecurity has been on the rise for years. 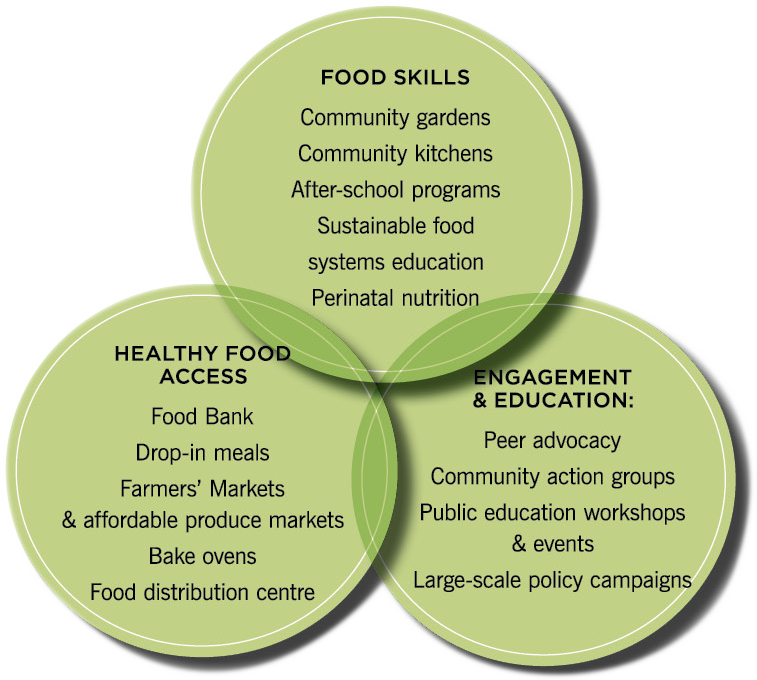 The recently released Report on Household Food Insecurity in Canada, 2011 states that nearly 3.9 million people experienced some form of food insecurity in 2011, an increase of 450, ooo people since 2008. The main premise of the book is that food banks don’t solve the problem of poverty. In fact, the exchange that occurs in food banks leaves the recipient of food feeling demoralized and humiliated while the people who work in these centres feel good about themselves for helping those less fortunate.. The Stop`s response builds agency in people. It gives voice to an ignored community. It meets the immediate need of feeding hungry bellies while at the same time breaking down barriers that lead to social isolation, linking people to each other and to much needed resources to deal with their housing or health issues, treating marginalized people like human beings. It`s an inspiring story and a really interesting read. I liked how stories of people who used The Stop were woven in with history and facts about food banks and the food systems of the world. It was amazing to follow some key people as they went from recipients at the food bank to participants in programs to volunteers, taking ownership and running programs, and in some cases paid employees. Of course, not every story had a happy ending, but it was awesome to hear about the success stories. 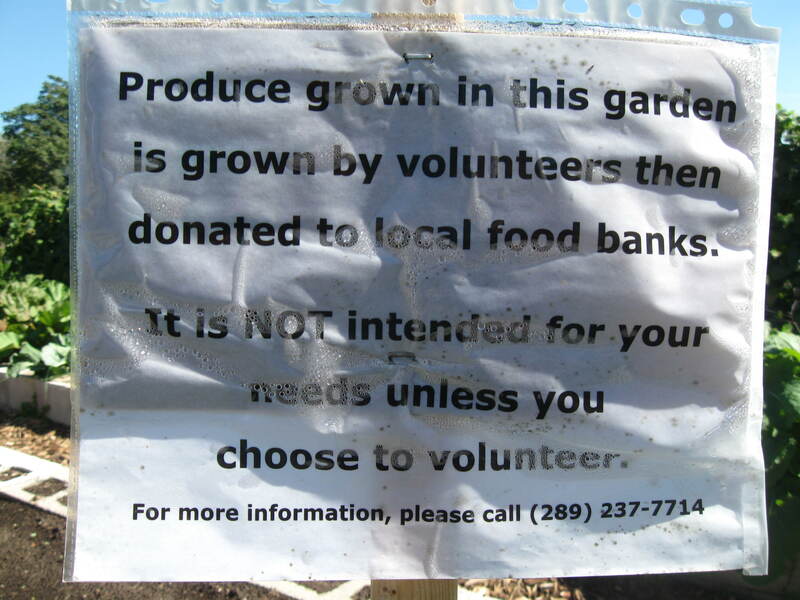 Did you know that food banks were meant to be a temporary solution to hunger after the war? Now they are a staple across the globe. I found this book, this story, insightful and moving. Nick Saul is my new hero! 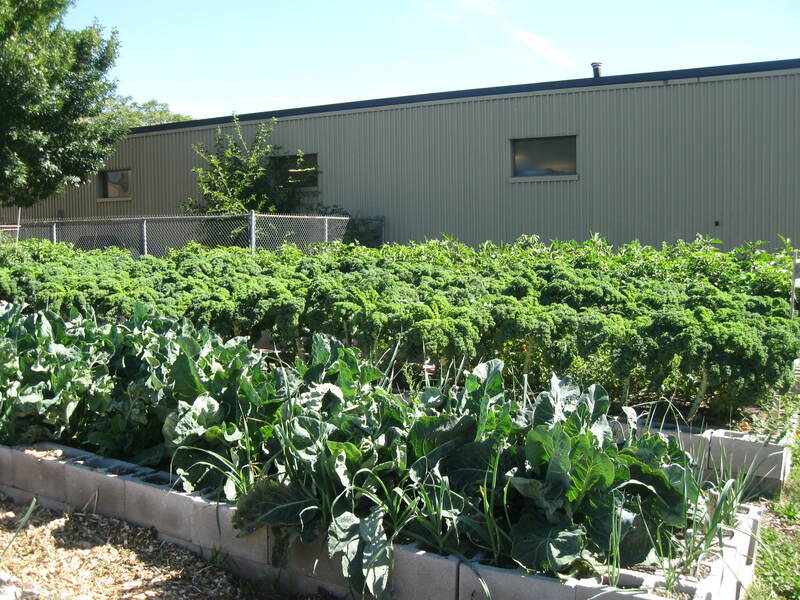 Last week at lunch I was walking to the Food Basics on Barton street when I noticed a gigantic garden behind the building that I had never noticed before. Turns out it was a victory garden. There were a few people harvesting in the hot sun. I said hi to a man pushing a wheelbarrow of greens he had just harvested as he gave me a suspicious sideways glance. I wanted to ask about the gardens but he didn’t seem very open to talking. I walked through the gardens expecting that he was eyeing me closely. I can understand his suspicion as I have had veggies stolen from my community garden a few times. I was shocked by the acreage of fresh veggies before me! Raised beds of beets, peppers, and other veggies along with marigolds as a companion plant to ward off pests. I think those tall bushes at the back are tomatoes. Clear signage hopefully helps to keep people from stealing. Normally I would be all excited about this project, but all I could think was that this act of Christian charity is self-serving. Help the less fortunate and feel better about yourself. This way of thinking creates an us (the haves) and them (the have nots) situation rather than really trying to empower people and bring about change. I felt the same way after reading an article in The Spec that someone left in the lunch room last week (the article also made me think that people are quick to open their pockets for children’s causes, no question. For some reason, a starving child is more worthy of your money than a starving adult). I know I`m being way too critical and I shouldn`t be. 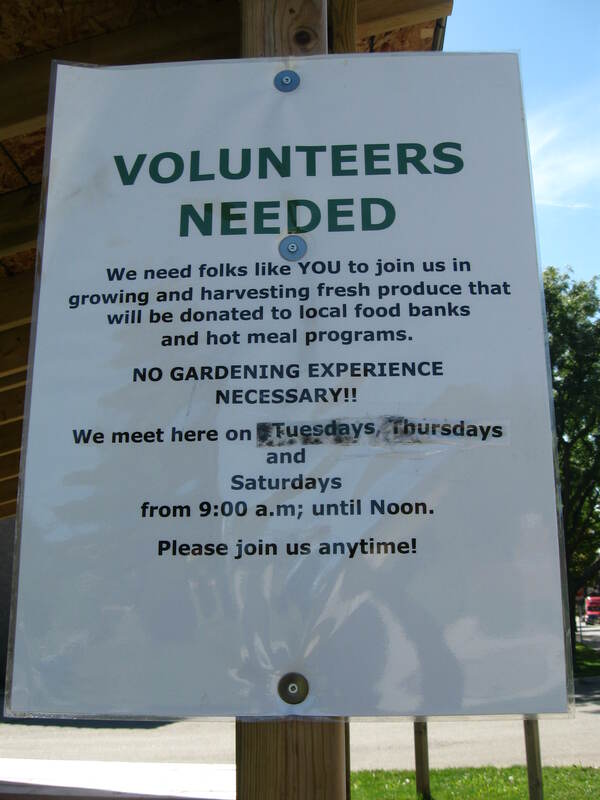 At least this group is going above and beyond by offering people fresh produce rather than the commercially processed junk people tend to donate to food banks. It’s a step in the right direction. 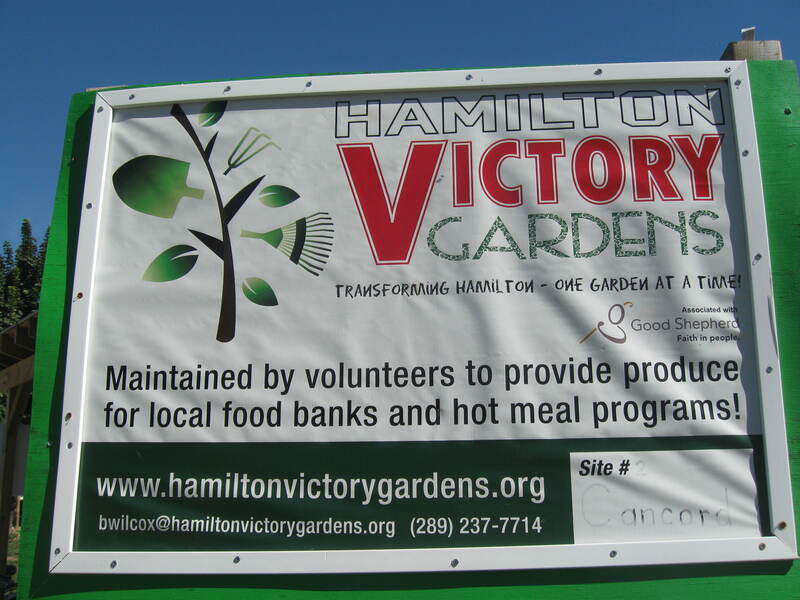 And this organization is a really good example of how ordinary people can create something extraordinary (see the about us page of the Hamilton Victory Gardens site for a history of how the gardens came to be). Despite my criticisms, this is definitely something I would consider getting my hands dirty for if I lived in Hamilton. 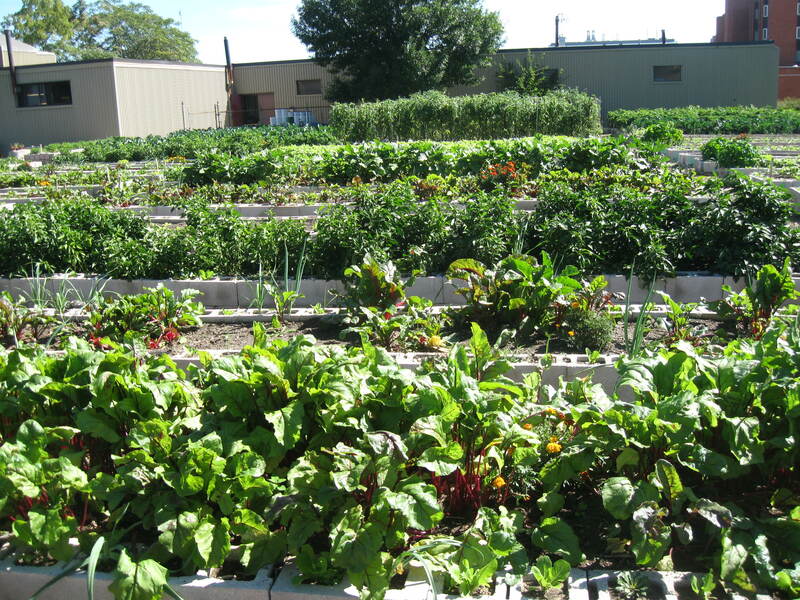 I would feel proud that I was helping to get healthy, fresh food onto people’s plates.